HGH Infrared Systems will be exhibiting at the IFSEC International with their most compact solution for wide area surveillance of critical infrastructures, the Spynel-M.
HGH Infrared Systems will be exhibiting at IFSEC International 2017 this week, presenting their latest and smallest sensor in their Spynel panoramic infrared surveillance systems line: Spynel-M. One of the largest security events in Europe, IFSEC International showcases the most cutting-edge technology and solutions from providers across the world. Spynel systems first made their debut into the security marketplace fifteen years ago, and since then, improvements to the system’s hardware and accompanying software, Cyclope, have consistently improved on the capabilities including: longer detection ranges, more customization options within the software for ease of use and scaling down the sensors for more mobile and temporary applications. 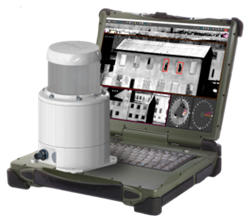 The Spynel-M weighs 1.8kg, making it the ideal and cost-effective solution for wide area surveillance of critical infrastructures such as: power stations, event security, prisons, dam, nuclear facilities and data centers. HGH Infrared Systems will be on Stand E1610 from June 20-22nd at Excel, London, UK for IFSEC International 2017. About HGH Infrared Systems: Founded in 1982, HGH designs, develops, assembles and sells high end optronic systems for security and industrial applications. HGH’s highly qualified engineering team comprises experts in optics, mechanics, electronics and software. HGH strives to provide advanced and innovative infrared equipment to protect their clients all around the world, while keeping the agility and dedication of a small and passionate team. Speed, flexibility, technical excellence and innovation constitute its core values. HGH has established itself as an international reference for infrared technology innovation through the development of multiple advanced thermal sensors, among which its award-winning real-time 360 degree thermal camera, the Spynel-C - 2008 Product of the Year from Photonics Tech Briefs, 2010 Innovation Prize from the EuroNaval Committee, 2011 Kummerman Award from the French Academy of Marine, 2012 GovSec Platinum Award, 2012 Govies Homeland Security Award, and the 2014 Best Video Tracking/Wide Area/Long Range Surveillance from Government Security News’ Airport, Seaport, and Border Security Awards Program.